The UCLA Bruins scored two runs in the top of the 10th inning to take a 5-3 lead, allowing All-American reliever David Berg to finish off the Cal State Fullerton Titans in the bottom of the inning en route to a game one victory. The Bruins are now one win away from a birth in the College World Series in Omaha, as the best-of-three series will resume tomorrow with game two scheduled to commence at 7:00 PM at Goodwin Field in Fullerton, California. 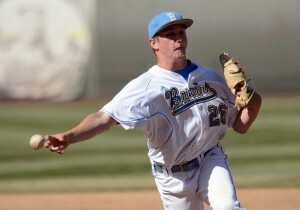 Eric Fillia lead the Bruins offensively with four hits and an RBI, while staff ace Adam Plutko pitched seven strong innings, allowing just one run (unearned) while striking out two batters and walking one before turning the game over to the bullpen. James Kaprielian would relieve Plutko in the eighth inning, surrendering a lead off walk to Richy Pedroza. Bruins closer David Berg would take over from there, surrendering two runs (the latter coming off of a Michael Lorenzen infield single) and allowing the Titans to tie the game 3-3. Fillia would break the game open with a go-ahead RBI single in the tenth, which would be followed by a sacrifice fly to right by Pat Valaika, cementing a 5-3 lead for the Bruins. Berg would close out the bottom of the tenth, finishing the game with four strikeouts over three innings of relief work, en route to a game one victory for the Bruins. Michael Lorenzen and the rest of the Titans now face a must win situation as they now sit on the precipice of elimination come tomorrow’s game.